My kids always loved the time we spent studying the solar system. If your kids do, too, you can use this resource round-up to learn about our solar system and the planet Earth. Then, be sure to scroll down for a fun new freebie! 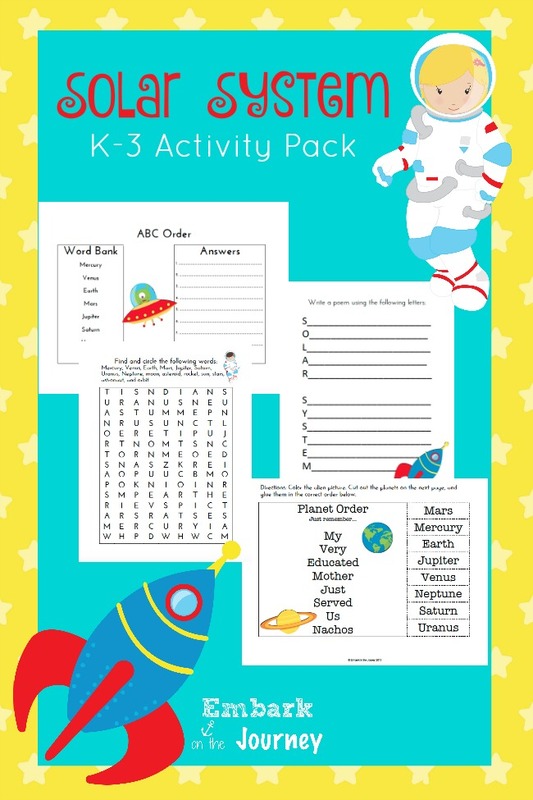 This activity pack was created for use with your K-3 kiddos! My kids always loved using a roll of toilet paper to represent the distance of each planet from the sun. Here’s a unique idea for a solar system diorama from Storm the Castle. If you don’t mind messy projects, you could try your hand at making a paper mache solar system like this one from Red Ted Art. Here’s a fun printable model from More Time 2 Teach that demonstrates how Earth and the moon orbit the sun. Gather up your junk to make a model of a space ship like these from Nurture Store. Print out these notebooking pages I created for Homeschool Encouragement. Please note that your link will expire in 3 days, and it can only be downloaded twice. Be sure to download and save it once it arrives in your inbox. The printable is just amazing. Would be a nice reminder activity for our planetarium visit. What an awesome resource! I loved teaching about the solar system when I was a elementary teacher. Thanks for sharing at the #Made4Kids Link Party! Awesome! Thanks for featuring it.